Community Acquired Pneumonia (CAP) is an infectious disease that affects lungs due to bacterial or viral attack. It is most commonly seen in individuals with less contact with healthcare /medical systems or organizations. CAP is one of the major causes of high mortality. Streptococcus pneumoniae, Haemophilus influenzae, and Moraxella catarrhalis are the typical type of bacterial pathogens that causes CAP. This disease is associated with filling of fluids in alveoli of lungs which inhibits the lung functioning, fever, chest pain, and cough. Besides, the major symptoms include mental confusion, prominent headaches, myalgias, ear pain, abdominal pain, diarrhea, rashes, nonexudative pharyngitis, hemoptysis, splenomegaly, and relative bradycardia. CAP affects all age groups from infants to old age. The report highlights various diagnosis and testing methods used to detect CAP. Physical examination by experts may sometimes reveal the signs associated with CAP which further can be detected and confirmed by several diagnostic tests.The major diagnostic tests are chest x-ray or radiography, Sputum Gram stain and/or culture, and blood cultures. Besides there are several pathology test to detect CAP depending on the severity of illness ; these includes Complete blood cell (CBC) count with differential, Serum sodium level, Serum blood urea nitrogen (BUN) and creatinine levels, Serum transaminase levels, Serum phosphorus level, Lactic acid level, Creatine phosphokinase (CPK), C-reactive protein (CRP), Lactate dehydrogenase (LDH), Procalcitonin, Cold agglutinin titers, Urinary antigen testing for Legionella species and S pneumonia, Serologic studies for M pneumoniae, C pneumoniae, Bordetella pertussis, C burnetii, and Molecular diagnostics/polymerase chain reaction (PCR) testing. The key industry factors affecting the revenue generation in the CAP testing and diagnosis market are analyzed and included in the report. Moreover, the major market dynamic factors such as drivers, restraints, challenges and opportunities and their impact on the industry in next 5 years are weighted and captured exhaustively in the report. The report tracks the entire value chain of the market along with the suppliers and distributor analysis. Furthermore, the industry attractiveness section in the report offers the significance of the competitive rivalry in the market affected by the forces such as power of supplier, power of buyer, threat of new entrant and threat of substitution. The report provides precise and comprehensive insights on the market trends, industry trends, and macro & micro factors impacting the market growth. In depth analysis of treatment and therapies used to cure CAP accounts for major portion in the report. The treatments and drugs vary depending on the age group of affected individual. Majorly antibacterial and antiviral drugs are prescribed to the patients after the detection of CAP. The common antiviral drugs include ribavirin, oseltamivir , zanamivir, and acyclovir; whereas, amoxicillin, azithromycin or clarithromycin, ampicillin, vancomycin or clindamycin , ceftriaxone or cefotaxime, and gentamicin are the major antibiotics prescribed to CAP affected patients. The report also analyzes the penetration of these therapies across all major geographies. 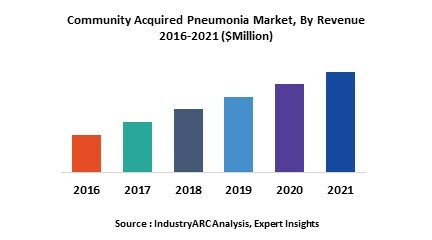 The market of CAP treatment and diagnosis in further segmented with respect to major geographies of North America, Europe, Asia-Pacific, and Latin America. Moreover, the countries generating high revenue in these regions have also been analyzed along with exhaustive coverage of developments and innovation in these countries. The report also offers extensive research on the key players in this market and detailed insights on the competitiveness of these players.The key business strategies such as mergers & acquisitions, partnerships, collaborations, and contracts adopted by the major players are also identifies and analyzed in the report. 15.9. Merck & Co., Inc.